Our approach to facial rejuvenation is different from the standard facelift. We perform a specialized facial rejuvenation in Rhode Island procedure that is artistically tailored for each patient’s individual needs and desires. Our specialty is to give each patient a very natural and more rested, youthful appearance. Facial rejuvenation from our board-certified plastic surgeon, Dr. Patrick K. Sullivan, can dramatically reduce signs of age in the face with results that look beautiful and natural. Facial rejuvenation can’t stop the aging process. What it can do is “turn back the clock,” improving the most visible signs of aging by removing excess fat from the neck and jowl area, tightening and lifting underlying tissues back into a more youthful position, sculpting, enhancing cheek bones, and redraping the skin of your face and neck. Our facial rejuvenation in Rhode Island procedure is done under intravenous sedation with an overnight stay in a recovery facility with our private nurse. Although there will be some bruising and swelling after the procedure, this will typically fade significantly in about 2 to 3 weeks (see “The Kindest Cut”). The final results from facelift surgery is usually most apparent after 4 to 6 weeks, or sooner, with continued improvement for several months. What it’s like to have facial rejuvenation? John was a successful 62 year old who became disenchanted with his double chin as he reached his fifties. After several years of feeling insecure about his appearance, he finally reached out to Dr. Sullivan to find out what could be done to improve his look. Additional procedures that may enhance the results include: brow lift, eyelid surgery, nose reshaping, earlobe reduction, or placement of fat and stem cells into areas of the face to enhance lips, cheeks and jawlines or to fill in deep creases. 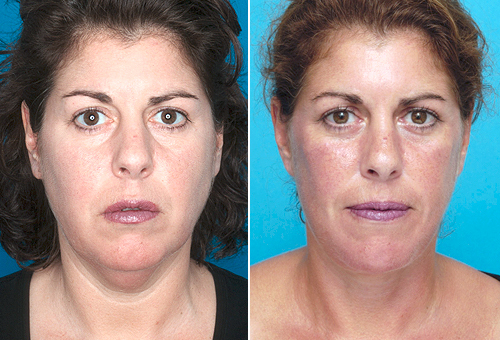 Please contact Dr. Patrick K. Sullivan to schedule a consultation for facelift surgery in the Rhode Island area. We will be happy to answer any questions you may have. If you would like to view more actual patient results, please visit our facial rejuvenation gallery. My experience exceeded beyond my expectations. I am very pleased with my results, I highly recommend Dr. Sullivan! He is the best !!!! Dr sullivan and his staff were wonderful..he is a very talented physician and is a true artist. very meticulous and thorough, as well as kind and compassionate. after facial rejuvenation, i can wear my hair up for the first time in years and show my jawline..people feel i look rested and years younger, but not that i had “something done”. it’s a very natural look. he is extremely skilled.